With the NHL 2018-19 season in the midst of its exciting stretch run, it’s time to look closer at the division races and see which storylines will lead to playoff berths. Many teams are still in the hunt for a playoff spot and here are division races to keep an eye on. Last year’s two top finishers, the Tampa Bay Lightning and Boston Bruins, again lead the way but two of Canada’s storied franchises, the Toronto Maple Leafs and Montreal Canadiens, also have an eye on the postseason. While Tampa Bay holds a commanding lead, time will tell if they have the stamina to fight off the contenders all the way to June. This division is truly up for grabs as just a handful of points separate the top five teams. The razor-thin margin among the defending champion Washington Capitals, Carolina Hurricanes, Columbus Blue Jackets, New York Islanders and Pittsburgh Penguins ensure that this division race will go down to the wire. Currently, the Winnipeg Jets and Nashville Predators top the division but don’t count out the St. Louis Blues just yet. The Dallas Stars and Minnesota Wild have some ground to makeup but this is the time of year when streaks start and either one could disrupt the current balance of power. The Calgary Flames and San Jose Sharks have staged a classic race for first place down the stretch, trading places on several days. However, last year’s Stanley Cup® finalist the Vegas Golden Knights and the upstart Arizona Coyotes are lurking in the shadows and would be strong challengers in the postseason. 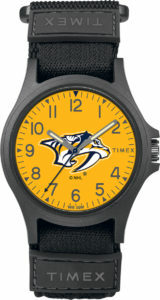 Show your support for your favorite NHL team right on your wrist. 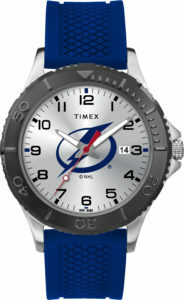 Timex helps NHL fans honor their team with the Timex Tribute® Collection. 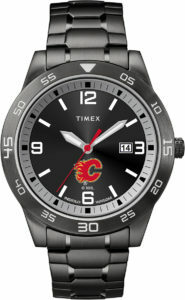 Complement your jersey (or your ‘sweater,’ depending on where you’re reading this) with a Timex Tribute watch. Even when you don the full uniform, you can still subtly show your support. Check out the complete NHL® Tribute Collection. NHL, the NHL Shield and the word mark and image of the Stanley Cup are registered trademarks of the National Hockey League. 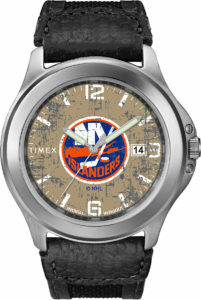 NHL and NHL team marks are the property of the NHL and its teams. © NHL 2019. All Rights Reserved.